A new search engine launched by the Dutch film industry is targeting 'pirates' specifically. Every movie or TV-show page lists legal viewing options but also includes pirate keywords and descriptions, presumably to draw search traffic. "Don't Wrestle With Nasty Torrents. 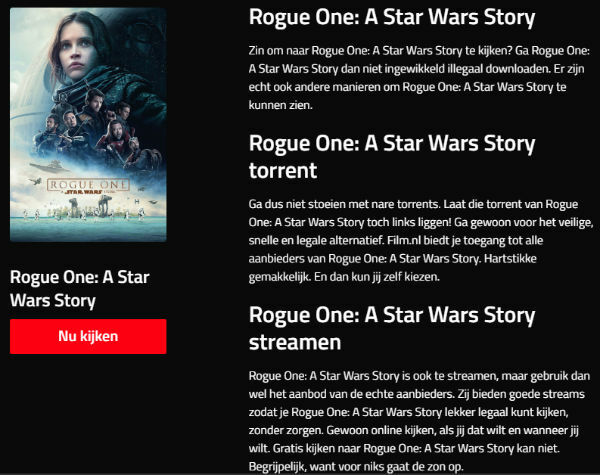 Ignore the Rogue One: A Star Wars Story torrent," the site advises. An often heard excuse from pirates is that they can’t find the content they’re looking for in their home country, at least not for a decent price. The movie industry has repeatedly attacked what they see as a myth, pointing out that movies and TV-shows are more widely available than ever before. In addition, they are putting action behind their words. In the US, Hollywood’s MPAA launched the movie and TV search engine WhereToWatch, to help people finding legal content. An interesting service, but also hard to find in search engines, especially when it first launched. Yesterday, several major players in the Dutch film industry came out with a similar initiative. They’ve apparently learned from the mistakes others made, as the legal Film.nl search engine was built with pirates in mind. Like other “legal” search engines, the site returns a number of options where people can watch the movies or TV-shows they search for. However, those who scroll down long enough will notice that each page has a targeted message for pirates as well. The descriptions come in a few variations but all mention prominent keywords such as “torrents” and reference “illegal downloading” and unauthorized streaming. Another description targets unauthorized downloading in general. “Do you feel like watching Rogue One: A Star Wars Story? Don’t download it illegally then. There really are other ways to watch Rogue One: A Star Wars Story,” it reads. And finally, those who are interested in streaming the movie, are inaccurately informed that a legal “Rogue One” stream is available. “Rogue One: A Star Wars Story is also available for streaming, but make sure to use the offerings of real providers. They provide good streams so you Rogue One: A Star Wars Story can enjoy it legally, without any worries,” it reads, adding that nothing in life comes free. There are of course no legal streams for the movie yet, but that’s the downside of these automated descriptions. The upside is that it will bring in quite a bit of traffic to the site. While the piracy related messaging is unusual, it’s actually quite clever. Since a lot of people are searching for “torrent,” “streaming” and “download” related terms combined with movie and TV-show titles, it helps to keep search traffic away from pirate sites. In other words, it’s a smart search engine optimization trick, helping it to directly compete with pirate sites on this front. The big question is whether people who search for “Movie X torrent” will be satisfied with the results Film.nl offers. That said, from a movie industry perspective, it definitely beats doing nothing at all.